Rugelach and Hamentaschen Gift Box for sale. Buy online at Zingerman's Mail Order. Gourmet Gifts. Food Gifts. Two of our favorite Jewish baked goods in two different flavors for four different sweets that are sure to please. 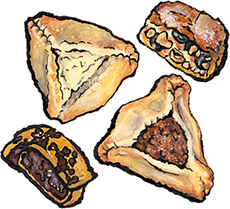 We'll include six hamentaschen — the triangle-shaped, open faced cookie dough pastries usually eaten during the Jewish celebration of Purim — with three each of the most popular vanilla cream cheese and apricot flavors. Then we'll tuck in eight rugelach — the crispy, flaky, cream cheese pastry that's the royalty of Jewish baked goods — with four each of raspberry and classic walnut & currant flavors. Also available with a pair of noisemaking groggers to really ring in the Purim holiday. 'Those were the most amazing, delectable cookies ever made by man. There are four different cookies, and I could sing the praises of each. Sarah, you nailed the Mother's Day gift!!'"